Do you want to reduce the amount of paper waste your classroom generates? Perhaps you are a teacher only given a limited supply of paper for the year? Well the new product spotlight for the week may have just the solution- Shapes Desks with Dry Erase Tops from Balt. The original Shapes Desk has been re-imagined to provide students and teachers with dry erasable desktop. The high-gloss white laminate desktops bring the wall mounted whiteboard right under your students’ noses. As opposed to the traditional front-and-center classroom whiteboard, desktop whiteboards may allow some students to be more comfortable joining in on brainstorming sessions or working out math problems. The collaborative shape of these student desks allows users to create circular clusters of five and a huge range of other configurations. Outfit the Shapes Desk with wheelbarrow casters (set of two desk wheels) and you can a rotating classroom arrangement all day long. 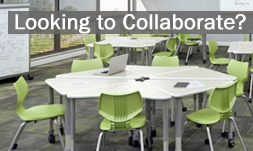 Collaborative desks have been championed by advocates of STEM and STEAM curriculum. Here’s video showing how amazingly versatile these desks can make your classroom. The Dry Erase Shapes Desks are available in two sizes; roughly 27″ or 31″ in width. The legs adjust from 22″ to 32″ high which meet ADA compliancy and allows these desks to be used by a wide range of student ages. Options include bag hooks, wire book racks, and a choice of edge and frame colors. If you have existing Shapes desks, you can mix in a couple of the new dry erase topped desks so that at least one desk per cluster has that capability. Sort of like a team captain. There are also Markerboard Tables from Allied if you need additional dry erase work surfaces in your classroom or office. You can even buy dry erase markers in bulk along with other whiteboard accessories from Worthington Direct, your one-stop-shop educational furniture and equipment.